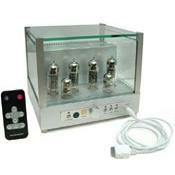 Jolida FX10 integrated vacuum-tube stereo amplifier provides state-of-the-art technology in vacuum-tube amplifiers. The design objectives for this unit were three-fold: 1) to provide an amplifier that would improve musical accuracy to the fullest for such products, 2) to provide the customer with a quality amplifier at a price far below other tube amplifiers, 3) to provide an all-vacuum tube amplifier that would approach the reliability of good solid state amplifiers. This amp failed and started red plating tubes randomly. I contacted jolida by email and even spoke to them on the phone. They told me it wasn’t the amp because it has protection circuits and won’t tirn on if it’s damaged. They told me it was the tubes , which are brand new. I switched to their tubes and the amp co tongues to glow red hot in a different tube socket each time it’s tirned on. This destroyed the $80 worth of tubes . When I tried to contact jolida again they will not answer me after three weeks. I will never buy another jolida . Fails and destroys tubes, bad support no support. I have heard quite a few tube amps over the years-- VTL, Cary, VAC to name a few. My favorite was a VAC Avatar integrated that sounded magical driving a pair of B&W speakers. Today, with a family, I cannot afford high-end audio gear. I also have a two year old son who loves to get into everything. I love the sound of tubes and tried going with a solid state set up-- a NAD 325BEE. While the NAD is a fine integrated amp at its price, I still longed for a tube amp. I lucked upon a used Jolida FX10. Driving a pair of Silverline Minuets in a desktop setup, the FX10 is a feast for the ears. With the NAD there is a lot more bass and perhaps a more even sound. However the FX10 gives me the 3D soundscape that tubes are known for. That sense that I can look into the music and see the instruments and most importantly the atmosphere. No doubt, the Jolida is bass shy. The Minuets sound great with tubes but at 88db sensitivity probably need a 35 watt tube amp to really shine. However for a nearfield, desktop setup, the combination suffices and gives me what I want. I'm also fond of keeping component costs inline with one another-- it doesn't make much sense to drive a $400 pair of speakers with $1000's worth of electronics. So much fun. Great little amp with sweet sonics. It is great as an office system or for a bed room. Looks great too. I will replace the stock tubes at some point.